Hooking up a computer to a plasma TV has opened up many possibilities for playback of DVDs I've purchased and media files that I've downloaded off the internet. Since playback from a hard disc is much more reliable than it is from a DVD, I copy all DVDs to my computer that I plan to watch. It wasn't long before I was adding a couple of 2TB drives to my computer to hold a giant library of media but even that has turned out to not be enough storage for everything because my library keeps getting bigger and bigger. But, where there's a will (and money) there's always a way. This 10TB USB array cost about $565 for everything and all of the parts were purchased from Amazon. Some of these prices have gone up a little since I put this together. The 2TB drives are currently going for $99 and the Dome Hub is currently $29, but you can still buy all the components for just over $600. A power director is used so that each hard disc can be powered up separately when needed. "Power Strip Adapter Liberators" (short extension cables) are used because each drive has its own transformer, aka "wall wort." A Rack Shelf is used to keep everything tidy and make the entire unit easy to transport. 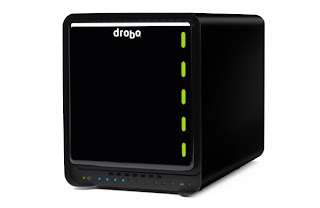 The Drobo-FS I bought from Costco came with 3, 2TB drives and two additional empty slots for $900. The fans are quiet and the unit really looks impressive and attractive. You can mix and match any capacity drives and installing a new drive is as easy as just plugging it in and letting the Drobo do its thing. This unit is not as fast at transferring huge amounts of data as my USB array but it has something else my USB array doesn't have -- fault tolerance -- any single disc can die and you won't lose your data. But that fault tolerance comes at a price in storage capacity. It takes about 1.8TB of total available storage to maintain the fault tolerance, no matter how many discs you have installed. So with 5X 2TB drives installed you have a total usable storage capacity of about 7.2TB out of a total of about 9TB. Why 9TB instead of 10 when you have 5X 2TB drives? Because the drive size is different than the formatted capacity. A 2TB drive has a storage capacity of only 1.81TB after its been formatted. Republicans took control of the House last November by taunting President Obama and the Democrats with "Where are the jobs? Republicans said their campaign was about creating jobs, but since they took office it’s clear that cutting government spending comes first, last and always -- now that they've cut taxes for the rich. How can Republicans fight for massive tax breaks for the rich and as soon as they get that immediately pivot into being reformed big spenders who now claim to be deficit hawks, and do it without looking like hypocrites? Good question, but it appears that they ARE getting away with it and, much to the dismay of many who supported him, President Obama has also bought into this nonsense. Republicans say a smaller government eventually will spur private-sector job growth. Yeah, eventually. However in the mean time, government spending pays for research, infrastructure, education and other programs that create or protect existing public- and private-sector jobs. GOP leaders already acknowledge that thousands of government workers would lose their jobs in the short run under the $61 billion cost-cutting bill they are pushing. The Economic Policy Institute says that overall, the House GOP plan "would likely result in job losses of just over 800,000." If that happens, "so be it," said House Speaker John Boehner, R-Ohio. "We're broke." After the outcry over that remark, Boehner told reporters, "I don't want anyone to lose their jobs," but "we've got to make tough decisions." The evidence that federal spending hurts job growth "is thin to nonexistent," says Princeton economist Alan Blinder. If the economy were running at full capacity, he said, Republicans would have a valid argument in saying that an extra federal hire or expenditure might displace a private-sector hire or expenditure. But there's a lot of "slack in the economy," he said. Republicans are repeating an economic policy right out of the 1930s — they want to cut spending before a recovery is assured. As the country began to recover from the Great Depression, Republican complaints about rising budget deficits forced President Roosevelt to agree to steep budget cuts. From 1933 to 1937, the United States economy expanded more than 40 percent, even surpassing its 1929 high. But the recovery was still not durable enough to survive the spending cuts, and in 1938 the economy shrank 3.4 percent and unemployment spiked. It took the increased spending from the military buildup prior to the start of World War II to create a lasting recovery. Corporate profits are up. Stock prices are up. So why isn't anyone hiring? Actually, many American companies are hiring -- overseas. This is why unemployment remains high in the United States, edging up to 9.8 percent last month, even though companies are performing well: All but 4 percent of the top 500 U.S. corporations reported profits last year, and the stock market is close to its highest point since the 2008 financial meltdown. But the jobs are going elsewhere. The Economic Policy Institute says American companies created 1.4 million jobs overseas last year, compared with less than 1 million in the U.S. Those 1.4 million jobs would have lowered the U.S. unemployment rate at least one percentage point. Manufacturing of durable goods is moving overseas along with the jobs. Congress needs to do something to reverse this trend before the American middle class disappears completely. America cannot survive without a strong middle class because without their purchasing power economic activity and job growth will continue to suffer. The answer is not lower wages for workers and lower taxes for business who are headquartered in the US but do all their manufacturing overseas. American workers cannot compete with workers in developing nations who work for poverty-level wages without lowering their standard of living to poverty level as well. If we’re going to continue to give tax breaks to business they should be used as an incentive to create jobs in the US. In December, a study from University of Maryland researchers found that Fox News viewers were vastly more misinformed than news consumers who depended largely on other outlets for their information. Fox News immediately attempted to discredit the study, but leaks from Fox News staffers and consistency in messaging have shown a disturbing pattern of talking points that are repeated on Fox News throughout the day. A June 4, 2009 internal memo from top Fox News Channel editor Bill Sammon was leaked recently,that said, “FYI: My cursory check of Obama’s 6,000-word speech to the Muslim world did not turn up the words ‘terror,’ ‘terrorist’ or ‘terrorism’.” Immediately, numerous Fox personalities grabbed the ball and ran with it; Megyn Kelly, Brett Bauer, Shep Smith, and other personalities on supposedly unbiased ‘news’ shows, even Sammon himself, used the fact that the president’s speechwriters had chosen to avoid that particular word choice as unnecessarily inflammatory to mislead viewers, suggesting that the President did not address Muslim extremism and intolerable violence during that speech. In another leaked Sammon memo, on-air talent was instructed to NEVER mention "global warming" without also calling the theory into question. Fox News continued repeating the lies long after they were refuted. And even afterwards, as embarrassing as this incident should have been for them, they never did admit that their reporting was factually incorrect. Given what we know about the sources and the quality of the news that Republican voters regularly consume it's no wonder that they are so woefully misinformed and angry, and they vote accordingly. Watch the first five minutes of Fox and Friends in the morning and you can easily make a short list of the anti-Obama and anti-Democrat daily talking points that will be repeated by every anchor and commentator over the next 24 hours. For the Hannity show on Fox News, GOP pollster Frank Luntz gathered some Republicans in Iowa together to watch Bill O'Reilly's interview with President Obama during the Superbowl Pregame Show. During Luntz’s questioning, one person claimed that President Obama's religious convictions guide his policies. Luntz asked her to clarify and the woman said, “I believe that he (Obama) is a Muslim.” Luntz then asked the rest of the group how many believed Obama is Muslim. Nearly half raised their hands. Many Republicans believe that Obama is a Muslim despite Obama's repeated and well publicized identification with the Christian faith. Sadly, the Iowa focus group did reflect the national Republican consensus. Last August, in a Time poll 46% of Republicans said they believe Obama is a Muslim. 46%!!! Why are Republicans so ill-informed? It’s probable that some of them know better, but they repeat the lies about Obama because they think it helps their cause. As for those who actually believe the lies they repeat, they are getting their information from the well-oiled (financially) far right propaganda machine and its associated echo chamber. There have been emails circulating since 2007 that say, “Obama takes great care to conceal the fact that he is a Muslim“ and then go on to offer up lots of bogus “proof.” The entire case, such as it is, rests on a confused and error-ridden recitation of Obama's upbringing and purported childhood influences. It also exploits a deep fear and mistrust of the Muslim faith. What began as a stealth email campaign to label Obama as an "outsider" and "not like us" was quickly taken up by the right-wing blogosphere and repeated endlessly on right-wing talk radio. Meanwhile Republican leaders have either actively assisted in perpetuating the lie or have been giving it a wink and a nod. Speaker Boehner was questioned on Meet the Press about the persistent belief among nearly half of Republicans that Obama is a Muslim and he was asked whether he, as speaker of the House, had a responsibility to "stand up to that kind of ignorance," Boehner told host David Gregory: "It's not my job to tell the American people what to think." Gregory then asked, "But that kind of ignorance, about whether he's a Muslim, doesn't concern you?" "The American people have the right to think what they want to think," Boehner replied. "I can't – it's not my job to tell them." Not his job? Really? Republicans expend vast amounts of money and effort to tell people what to think about various issues. Indeed, Speaker Boehner, spends many of his Sundays on talk shows like Meet the Press pushing his party's agenda and being critical of Democrats. Apparently the only misinformation that is not Boehner’s job to dispel is misinformation about Democrats that benefits Republicans. When asked what they personally believe about Obama’s religion, Republican leaders always give the same answer, “I take him at his word.” This answer is so uniform among the Republican leadership that it cannot be a coincidence. Republicans don’t want to alienate the crazies and the birthers who make up almost half of their base by openly refuting the lies so they equivocate, and that equivocation only serves to perpetuate the lies. "For decades, the choice in Egypt has been: Does America support Mubarak or the Islamic fundamentalists? Obviously we take Mubarak." It's not a choice between Mubarak and Islamic fundamentalists, and it never has been. After Mubarak, the Egyptian Army has the most power and they will be the ones who take over when he is pushed out. The Muslim Brotherhood is relatively weak, but Conservatives are quite happy to use them as a boogyman to justify continued support for Mubarak. Supporting dictatorship over self-determination during a popular uprising against a despot that we have financed for many years will only further damage US relations with the Egyptian people. Popular uprisings in the Middle East are fraught with danger for US interests, but are we going to be true to our core value of self-determination for everyone or will we continue to do what is expedient? Conservatives always pay lip service to core values, but they are always the first to abandon them when they conflict with goals like making money or stability in the Middle East -- which is also mostly about making money. The far right has been trying to inoculate itself against any criticism of its role in stirring up anger and hatred to unprecedented levels in the past 20 years. We've all seen the rallies with nasty signs, the faces contorted in anger, the display of weapons, and we've heard the vitriolic spew from Tea Partiers and others on the far right who claim Democrats are destroying America. The fires of hatred are being stoked daily by far right talking heads on radio and television, the blogosphere and through chain emails. Some on the Left did speculate on the motivations of the Tucson murderer without any evidence whatsoever, except for the fact that the intended victim was a Democrat and a supporter of immigration reform. That was wrong, but it was also somewhat understandable given the way cable news operates after a breaking story of such magnitude. industry has been wasting its money. They will vote for Republicans. Because the Right benefits so much from hateful speech and the anger it stokes, they will always shout down any attempt to discuss its negative consequences and they will divert attention with false equivalency arguments. However this time they may be going too far. Fox News and the rest of the far right propaganda machine has been pumping out a steady stream of talking points of denials, false equivalency arguments, and victimization claims, and those talking points have been reverberating in the echo chamber to a degree that is almost unprecedented. This gross overreaction may well be what undermines the entire effort. The "Silent Majority" (to steal a phrase) is sick of the hateful speech and frightened by the acts of violence, and they're not buying the arguments put forward by the far right propaganda machine and its echo chamber.